The Macally Bookstand-Pro case is multifunctional: its an organizer, its a stand, it will keep your iPad concealed for safe travel.This case does it all! SUMMARY: This will function as a protective travel case and viewing stand and organizer. Get it for you and your friends! These were manufactured to be used in the USA. Use outside of the USA at your own risk. We're happy to help. Lisiting is for Thirty One organizer tablet case. Item is in good used condition. The iPad Shockproof Wallet Smart Cover Stand Case. Often copied but never equaled, the Yellow-Price® iPad case is now better than ever. Specifically designed for APPLE iPad Display Tablet. Automatically wakes or puts your device to sleep. Carry Organizer Case Tablet iPad Blue Nylon Fabric - Never Used + Free Shipping! Exterior is navy blue with a gray interior. Previously owned but NEVER USED. Rain Forest. 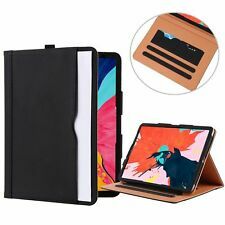 • Vertical padded pocket for a tablet. • Two large slip pockets. Why choose DACCKIT Carrying Case for Osmo Genius Kit ?. The hard outer shell is tough, durable and looks fantastic. This case is designed specifically for Osmo Genius Kit. Tailor made, fits perfectly. Object Retention System For Gadget Organization. The Macally Bookstand-Pro case is multi-functional: its an organizer, its a stand, it will keep your iPad concealed for safe travel.This case does it all! This was made by Macally for the iPad 2nd Gen but it also fits the iPad 3rd and 4th Generation. The UPC symbol has been carefully removed for promotional p.
Interior pockets and a front zip pocket help you get organized. Color - black with jade/aqua green. Interior organizer pockets. Padded tablet sleeve with zip-around closure. Embroidery details. Nylon exterior. Are you fed up with finding accessories for your travel?. Now get them sorted in this zip storage bag. Style: Travel Storage Bag. When creating new bags, Hynes Eagle focus on high-quality materials, fashion inspiration, and the functions of the bag to insure Hynes Eagle have created the perfect bag for you. Universal Padfolio Organizer Folder. The organizer case has smooth YKK zipper lock making it a heavy duty, and drop proof carrying folder. All PRECIOUS JEWELS Deserve a Special Case! We’ve got you covered. 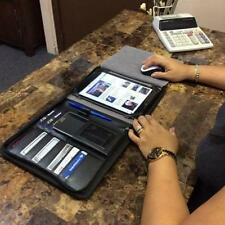 Clausen Zip Around Tech Organizer/IPad Holder. Zip around closure. Exterior features slip handle. 10.75" H x 8.5" W x 1" D - Leather. Item is 100% authentic. A TUMI NYLON TRAVEL/STORAGE CASE. PRE-OWNED IN LIKE NEW CONDITION. FITS UP TO 8X10" DEVICE. RED NYLON. FOAM Lined TOP ZIPPER WITH PULL. QUALITY MADE CASE! Condition is New. It says it fits up to 10”, but I was able to fit a 10.5” iPad Pro with no trouble. Our Iconic styles are a modern twist on our classic silhouettes, refreshed with added functionality. Vera Bradley ~ Tablet Tamer Organizer ~ Microfiber Black ~ iPad case Unopened. Condition is New. Shipped with USPS First Class Package. 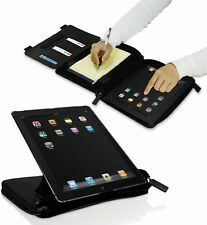 Up for sale is a PureGear Universal Tablet Folio 7-8" iPad / Tablet Case Cover & Organizer. Condition is Used. Zipper pocket on inside. Gently used note tablet included. See pictures for condition. Detachable iPad sleeve for landscape/portrait viewing. Clear ID pocket w/accessory flap and pen loop. Padded sleeve in the middle to prevent scratches on the screen. Made of Dura Hyde in two tones. Except state is HI and PR. HAWEEL 10 inch Tablet Wrap Organizer Neoprene Digital Storage Pocket Bag. The Traveler's Envelope is a must-have travel essential for all professionals and travelers alike. Make your next travel look stylish or buy the Traveler's Envelope as a gift. - 100% real waxed leather. 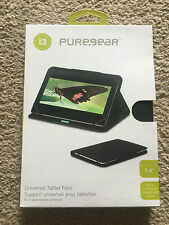 Pure.Gear Universal Tablet Folio - 9-10" Tablet Case & Organizer - Black. The perfect universal folio for your tablet or e-reader. - Flexible bands firmly hold the tablet in place. - Magnetic closure ( folds back while tablet is in use). THIRTY ONE Tri-Fold Organizer. Because I am not affiliated in any. Teal Big Dot. Brydge Organizer, USB Charging Cable and Portable Battery Review. For iPad Air, 10" tablets, smartphones. Multi use organizer. Hard to find green color. BLACK LEATHER CASE AND ORGANIZER. FOR I PAD 2 GENERATION. NOTE PAD HOLDER. DETACHABLE SLEEVE. Slim 2-fold organizer with double press-button fastener, Opens out to be fully-flat on your desk for easy access. Wallet Flip Case with credit/ID card slots and a pocket. Brand new Product! Great Buy!! Kensington Ipad Organizer black 8.5x10.75"
Black synthetic material with leather look and feel. The whole unit has a zippered closure. MACALLY BLACK ORGANIZER CASE ROTATE STAND POCKETS FOR iPAD 2nd 3rd 4th GEN. Condition is New. Shipped with USPS Priority Mail.